Hellooooo everybody out there at SimSports!! This is my first City Journal (hooray! ) so I hope you'll like it. This is King Daniel IV the Uniter, , wishing everybody a happy Saint Sebastien's Day! BTW, This is not the end; it's only the beginning! Thanks! It took a long time to make it, so I'm glad to have some appreciation! Sunrise Imperial News: Very well written. Suitable for a movie! Grand River News-Letter: Incredibly well done! That said, ON WITH THE STORY!!!!! ...The first inhabitants of Grand Island were Polynesians, mostly of Hawaiian origin, who came to populate the island around 650 AD. They had a thriving civilization on the island, based on trading with the Hawaiian Islands, until approximately 1100 AD, when most of them were mysteriously wiped out. No one knows exactly what caused the civilization to collapse, but theories include a war with the Hawaiians, a disease outbreak, a famine, and others. The modern history of Grand began in 1579 when Sir Francis Drake discovered the island during his circumnavigation of the Earth. He left about 35 sailors there as colonists in the name of Queen Elizabeth. He sailed on to complete his circumnavigation, while the small colony faded away into obscurity. All records of the voyage were destroyed in the great fire which destroyed Whitehall Palace January 1, 1698. In the meanwhile, the colonists had married some of the local women and started a small village which they named Elizabethtown (modern-day Fort Elizabeth) and elected a Governor, Francis Roberts, on the 27th of October, 1579. A few years later, a group of Spanish explorers landed at Round Lagoon, which they named Laguna la Mer, which means Lagoon of the Sea, referencing its rather large size (2 sq. km). Unfortunately for the Spanish, the waters of the lagoon were treacherous and both of their galleons were wrecked- one in Vulcan Strait and the other in the lagoon itself- leaving them stranded on the island. Although the Spanish were wrecked on Cape Sorrow and presumed themselves to be all alone on the island, besides some natives, who they fired at, they were not alone. Only about 9 kilometers away stood Elizabethtown, whose population had by this time risen to about 250 people. A large portion of the town was populated by the natives, who lived in harmony with the English, especially because they had native women for wives. Their Governor, Francis Roberts, was a kind, compassionate, just man, loved by all. The Spanish, numbering about 45, decided to have a look around and camped for the night at the foot of Pico Santa Maria, while a group of about 7 soldiers prepared to climb the mountain in the morning. When they reached the top the next morning, they saw a great river in the distance, where they could get fresh water. They decided to march there at once. Unbeknownst to the Spanish, their presence was known to the Colonists, and a group of about 10 English, plus about 40 natives, were already traveling towards the Blue River, flying the English flag defaced in the upper right corner by the Elizabethtown standard. When the Spanish reached the river, they found the Colonists waiting for them. The English attempted to ask for peace between them, but were fired upon by the Spaniards, killing 8 and wounding a further 35, the Governor being among them. The Unwanted War had begun. PS: In vexillology (the study of flags), 'defaced' means, for example, the English red cross on a white background, with a pattern in one of the four sections made by the cross. It has absolutely NO negative connotations. btw, will try, about the pictures, that is. Ok, I think I've got it. SC4 pics coming soon! 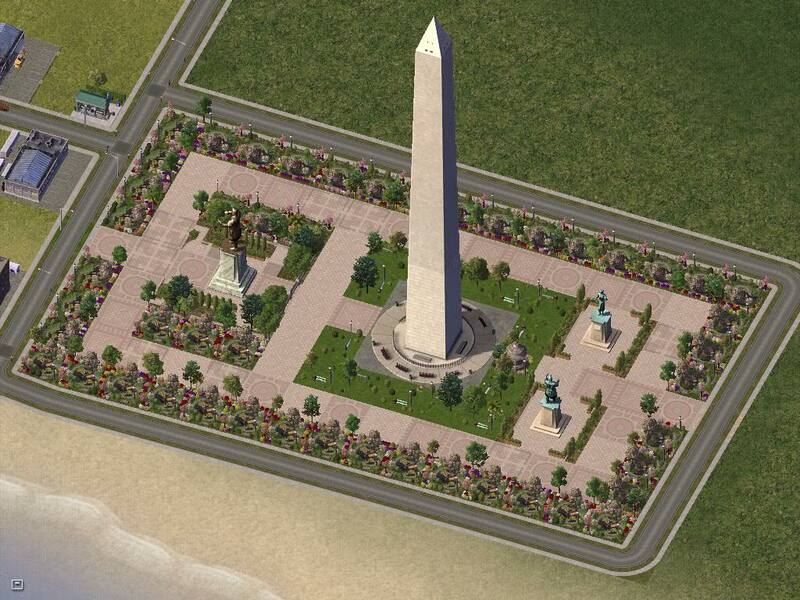 Okay, here's the first SimCity 4 picture- a memorial to the Spanish-Colonist war, built on the spot where the first fighting took place, at the Shores of the Blue River. 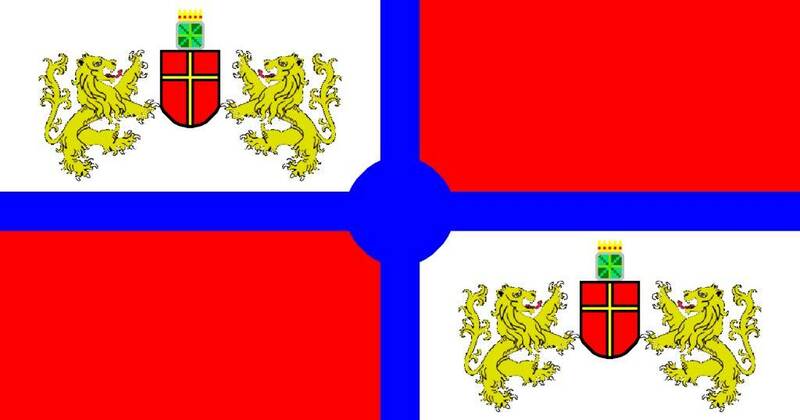 If you want to see my old coat of arms, look at my signature or the white part of my flag. The Next Episode in my history-coming soon! When the Spaniards fired their muskets, the Governor quickly assessed the situation. Realizing that they weren’t prepared for a full-scale battle right then, he merely ordered his remaining men to fire once at the Spanish and retreat. This incident would come to be known as the Battle of the Mouth Fords. The Colonists retreated to their half-finished fortress at the water’s edge of Elizabethtown, taking as many villagers as they could with them. Closely pursued by the Spanish, they had no sooner entered the fortress than the Spanish entered the town. Angered by the fact that the town had been evacuated so quickly, they set to burning the town and slaughtering anything in sight, while the Spanish commander, Captain Marcos Rodriguez, started to prepare for a potentially long siege. Again unbeknownst to the Spanish, the Colonists were able yet again to use the skills of their Native brethren. On the evening of the fourth day of the siege, under cover of night, a small group of Polynesians in outriggers slipped out from the castle’s jetty to warn the local chiefs and beseech their help. 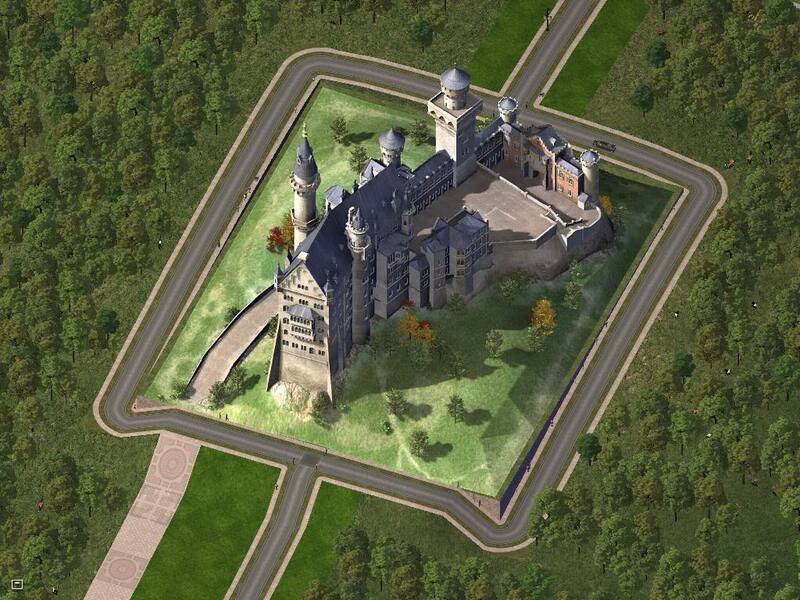 They also were to make arrangements to if possible evacuate the women and children residing in the castle. The head chief replied that since it was the fishing season, it would take a while to muster the required minimum of 100 men, but he would be happy to take the women and children in the meantime. Two days later, the first canoe, with four women and six children, captained by Governor Roberts’ oldest son, Phillip Mark Roberts, arrived. By the fourteenth day of the siege, despite the constant supplying of the fort with all the provisions they could spare, the amount of food in the castle was quite low. To make matters worse, they were running out of ammunition, and to top it off, half of the warriors were killed or wounded. The only piece of relatively good news in the last week was that the last women and children had been evacuated four days before. They soon decided to send a second message begging for relief as soon as possible. The Chief agreed, on condition that if the English were to win, they would help the Natives the way the Natives helped the Colonists. This mutual help was already an unspoken agreement, but the Chief wanted a written promise, which the Governor gladly gave. This was good news for them, but as they rowed home, the Spanish caught sight of them and cannonaded their canoe, with the result that the Governor was badly injured, as were two of the six oarsmen, the other four being killed, while their canoe was blasted to bits. However, six days later, the Native Army was on the march. Okay, one more post tonight. Here's a photo of the fortress nowdays. It was extensively damaged during a later war, and after the war was mostly rebuilt and remodeled as a royal residence. Basically all that's original of the fortress is the base of the walls, and part of the ramp. The footpath nearby, which leads to the old jetty, used to be part of the castle grounds during the fortress days, and is now paved with rubble from the ruined original castle. By the twentieth day of the siege, the defenders were practically out of food, having only 5 kilograms of meat and 5 loaves of bread for 37 men. On the other hand, the Spaniards availed themselves of plentiful food. Many of the men were little more than living skeletons, the Governor being among them. The Spaniards knew this and constantly taunted them by holding great feasts below the castle walls. They could do this without fear because by this time, the defenders had run out of ammunition and were reduced to wielding their swords and hurling rocks at them. On the 30th of July, the twenty-second day of the siege, the garrison was awakened by the sentries’ trumpets, as had occurred every day for the last three weeks. This day however, was to be very special. Soon after everybody had woken up, as the Governor was making his rounds, one of the sentries quietly beckoned him over. The Governor came over to him and asked what it was. He replied that he wasn’t sure himself if he had really seen it, but he thought he had seen an army in the distance, to the north. He asked the Governor not to mention this to any of the men because it might give them false hopes. The Governor agreed, but that same evening, rumors began to circulate around that a relief army was at hand. The sentry hadn’t been fooled by an illusion. It really was the Native Army he had seen, and the Natives had also seen the castle in the distance, but were slowed by boggy ground and had to camp for the night. The next day, the 31st of July, 1584, the twenty-third day of the siege, the Spaniards were taunting the Colonists with their feasts as usual, when one of them happened to glance north. He quickly let out a cry and alerted his companions to the new danger- an army of about 450 Natives only half a kilometer away and advancing quickly. They hurriedly rushed back to their camp, which was 100 meters away and directly between the Natives and themselves. By this time the Natives were only 200 meters away and closing in fast. After quickly consulting with his officers, the Governor decided to help the Native Army and had the gates of the fort opened. He then led a foot charge against the Spanish, together with 33 of his remaining men, out of the original garrison of 80 men. In the ensuing battle, which would come to be termed the Liberation of Fort Elizabeth, on the Spanish side, 6 Spaniards would be killed, 4 more would be captured, while the remaining Spaniards were wounded and put to flight. On the Allies’ side, 47 Natives were killed, and 78 were wounded, while 7 defenders were killed, the most notable of them being the Governor’s oldest son Phillip Mark, while 13 more defenders were wounded. Although the Colonists and Natives had suffered heavy casualties, the day was clearly theirs. The Spanish hadn’t fled too far. They were at that moment in the woods a few kilometers away, in the woods. They were waiting for the Natives to leave so that they could catch the Colonists off guard. However, the Natives leaving was the last thing either the Natives or the Colonists were thinking of. After the burying of the dead and treatment of the wounded, the Chief and the Governor got together to discuss what their next action should be. They agreed that they should send for some of the women to help tend to the wounds of the men, and that they should leave behind 125 men to protect them, while the rest of them went on in pursuit of the Spaniards. So they sent some messengers with spare horses to pick up some of the women and bring them back. Two days later, with everything ready, the Allied Army started in pursuit of the Spaniards. When the Spanish saw the Allies heading their way, they quietly melted back into the woods before they took any notice of them. The Spanish kept on retreating until they reached Howardspring, about a kilometer from the Blue River. There, they decided to enhance the local topography and use it to their advantage. They dug a deep, round trench around the spring and filled it with water. Then, they dug a second deep ring trench around the spring, but didn’t fill it with water. A hastily-constructed ‘aqueduct’, consisting of a few bamboo poles, carried the water over the inner trench. This inner trench would be where the Spanish would reside. It wasn’t too long before the scouts found out about this improvised fortification, and they reported it back to their commander. The Chief and Governor called a meeting to discuss their plan of action. They decided to make large, 2x10 meter planks with which to cross the artificial pond. The next day, the 5th of August, they set to work making the planks. By the 7th, everything was ready. With five large oaken planks, to be carried by 20 men each, the Allied Army resumed their march towards Howardspring. When they got to a safe distance from Howardspring, they went over the plans one more time, and then attacked. Although the Spanish were not totally unprepared, they were still surprised to see 100 men charging at them with great wooden planks on their shoulders, with about 110 men behind them firing their muskets and shooting their bows. They were coming at them from all sides. Unbeknownst to the Colonists, however, the Spanish had been working on a secret escape tunnel, which was almost finished at that moment. As the Colonists laid down their planks, the Spanish kept on firing their muskets at them, even when the first soldiers started to enter the trench, until a welcome cry from one of the men in the tunnel alerted the Spanish. They quickly started to enter the tunnel, but not before destroying the ‘aqueduct’, rapidly flooding the trench and tunnel. The last Spaniard got out just as the exit from the tunnel became a second spring of sorts. They quickly fled towards the Blue, while the Allies, exhausted, decided not to pursue them. Total casualties from the battle included 37 natives killed and 25 wounded, while 1 colonist was wounded. The Spaniards, except for a small wound in the arm of Marcos Rodriguez, suffered no casualties. Despite this, it was becoming rapidly apparent that the Spanish were losing this war. P.S. Do you think I should post less often then I do now? so far the history has been interesting, fairly well thought out so far. The flag is impressive, I think you could add a little more custom content into your cities but so far not bad. 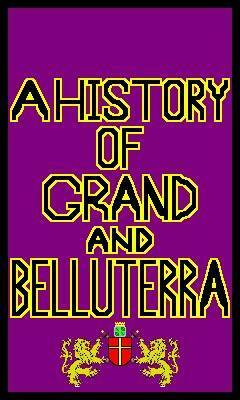 Well, the reason I have two national anthems is because when the Kingdom of Grand and the Republic of Belluterra re-united a few years back, they couldn't decide on which of their national anthems to use. 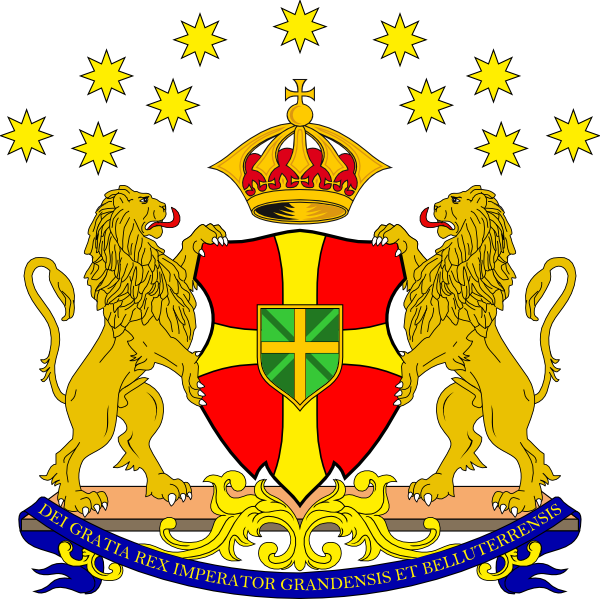 So, to prevent the newly-reunited nations splitting apart again over such a relatively minor issue, King Daniel V the Uniter of Grand (aka Emperor Daniel I the Uniter of Grand and Belluterra)(may he live forever)(he isn't called the Uniter for nothing ) proposed a compromise, where they would have both national anthems. The Spanish crossed the Blue without too much incident, and once they reached the other side, they camped there for the night. While around the campfire, they held a meeting to decide what to do next. Some of them were for going back and finishing them off while they were exhausted, until one of them pointed out that they were much more numerous and that they were exhausted themselves, while others were for launching a surprise attack on them when they passed this way, until another pointed out that there was practically nowhere to hide. However, the final proposal, from Captain Rodriguez, won the most approval. It was to retreat to Pico Santa Maria and hold out there for as long as possible, and if one of them were to die, then they would immediately start negotiations for a truce. Twenty-eight of them voted aye, two of them voted nay, and five of them chose not to vote. That same evening, they began the difficult trek to Pico Santa Maria. By the evening of the 9th, the Spaniards were nearing the top, when suddenly they heard a booming, rumbling sound and a bright light up ahead. At first they thought they had lost track of the time and it was the dawn beginning, but then they looked around them and saw the rest of the sky as dark and incredibly starry as before, and they knew it couldn’t be that, and anyway, it couldn’t account for the sound. Then they thought that perhaps a bolt from the blue had struck the magazine of one of their wrecked vessels, the Francisco Pizzaro, but when they rounded one of the sub-peaks and were able to see the Vulcan Strait, they saw their grounded vessel otherwise almost completely intact. A sudden shout from one of their men alerted Rodriguez. He rushed over and asked what was it. He shouted, “Look over there! !” Rodriguez looked for a moment, and then, with a terrified look on his face, ordered his men down the mountain at once. What was it he had seen? It was the mountain, which, as he realized, was actually a volcano. They practically ran down the mountain, and when they reached the bottom, they all collapsed from exhaustion. Being rather superstitious, they believed the eruption was a bad omen, which foretold disaster for them. The next day, they set to work building a 36 meters round fort, with small watchtowers every 45 degrees. It was mostly composed of wooden logs, but daubed with clay to give the impression of it being stronger than it really was. It was half-finished when an army on horseback, in armor, and all with rifles, appeared in the distance. The Spaniards refused to believe it was the enemy, and for the most part anyway, insisted that it was a Spanish relief army, implausible though it seemed. However, soon they were forced to accept the grim truth: it WAS the Allied Army coming to meet them, only they had greatly upgraded their weaponry and armor and numbers, so that they now numbered over 900 men. 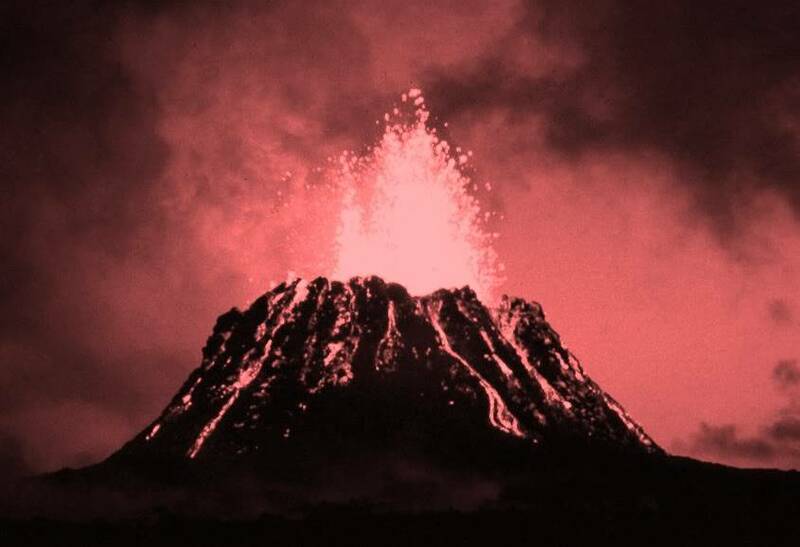 Ok, here's an image of Pico Santa Maria during it's biggest eruption, in 1896, I believe. Why not? We have two national anthems. Uh-huh, that's right. Btw, my first national anthem (God Save the King) is VERY similar to New Zealand's God Save the Queen, with a few relatively minor differences.